When I grew up in 90's, I recall every pan my parents used in the kitchen had Teflon. Teflon was considered "healthy" because it was non-stick meaning less unhealthy oils. Just avoid using metal spatulas that might scrap off the Teflon. So without doing my own research, I purchased a set of Teflon pots and pans for use in my first apartment during college. As my roommates came and gone, some brought with them stainless steel pots and pans. I was told (and agree) that these are better than Teflon. Even though stainless steel requires more oil to prevent sticking, it was better than the theory that Teflon can release harmful chemicals into food. 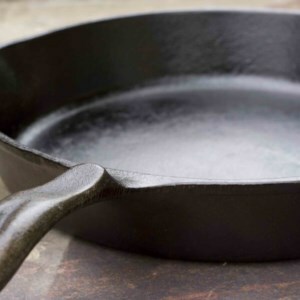 Not that I have joined the workforce, I have noticed a trend over the past few years that more and more of my peers are cooking with cast iron pans. PRO - non stick surface. CON - Many theorize that using Teflon may release unhealthy chemicals. Advisors to the EPA claim unhealthy chemicals (PFOA) released from Teflon during use should be classified as "lightly carcinogenic" (cancer causing). PRO - Teflon pans are available to be light weight (compared to Cast Iron). PRO - Teflon pans are available with plastic handles for easy handling while cooking. PRO - Can be non-stick if properly maintained and seasoned. CON - If not properly cared for, Cast Iron will rust. CON - Much heavier than Teflon or Stainless Steel pans. PRO - Has great heat retention for more even cooking. CON - Has a cast iron handle, which means you need hot hands when in use. Be sure not to burn yourself. I can handle it, bit it would be more difficult for my wife. PRO - Can be put directly into the oven. CON - No recommended for flat surface stoves that might scratch. So using Teflon pans has many benefits, but ruining your health by potentially increasing the odds of getting cancer is not worth the many benefits. Cast Iron is more difficult to use and maintain, but once a good habit is formed, it should not be a problem. We recently purchased a 3 piece set of Cast Iron pans by Universal Housewares (10 inch, 7.825 inch, and 6.25 inch) for ~$23 off Amazon. If weight or maintenance becomes an issue, it was only a $23 investment for good health, well worth it. 8 large US companies have by 2015 to insure that perfluorooctanoic (PFOA) doesn't is not released into the environment from finished products (though it can still be used during the manufacturing process). PFOA is linked to cancer and birth defects in animals. PFOA is bad because it stays in the environment and the body for a long duration of time. The EPA's Scientific Advisory Board states there is "suggestive evidence of carcinogenicity, but not sufficient to assess human carcinogenic potential." Provides a short list of other applications where PFOA is present. Also interesting is the story behind the various government responses to the use of PFOA.